A flexible tail allows swimming bacteria to thin the surrounding liquid and to free themselves when trapped along walls or obstacles. This finding could influence how bacterial growth on medical, industrial, and agricultural surfaces is controlled. The new study by researchers at Penn State, published in a recent issue of the Royal Society journal Interface, used mathematical models to understand how bacteria with flagella—a collection of spinning hairs used for propulsion that act together like a tail—overcome forces from the flow of a liquid and navigate complex environments. "Bacteria are the most abundant organisms on the planet and are often found in liquids," said Mykhailo Potomkin, research associate in mathematics at Penn State and an author of the study. "We know from recent experimental studies that bacteria can reduce the effective viscosity—the internal friction—of a solution, which helps them move more easily. "In solutions where the concentration of bacteria is large, this is due to collective movement of bacteria effectively thinning the solution, but a decrease of viscosity was also observed in dilute solutions where bacteria are less abundant," Potomkin added. "This effect has been explained by bacterial tumbling—random changes in direction of the bacteria—but a similar decrease in viscosity was also reported in strains of bacteria that don't perform this tumbling behavior. Our work suggests that the bacteria's flagella may be responsible." Using a mathematical model, the research team demonstrated that flexible flagella allow bacteria to overcome local forces between molecules, reducing viscosity and effectively thinning the liquid. This understanding might have important implications for the creation of biomimetic materials—man-made materials that mimic biology—to alter properties of a solution for biomedical or industrial purposes. "In order to understand whether we can control the viscosity of a solution, we need to understand how bacteria control it," said Potomkin. "Flagella play a key role in this control. We also investigated how bacteria use flagella to navigate a more complex environment by introducing walls into our model. Bacteria tend to accumulate on walls or obstacles and they often get stuck swimming along walls. 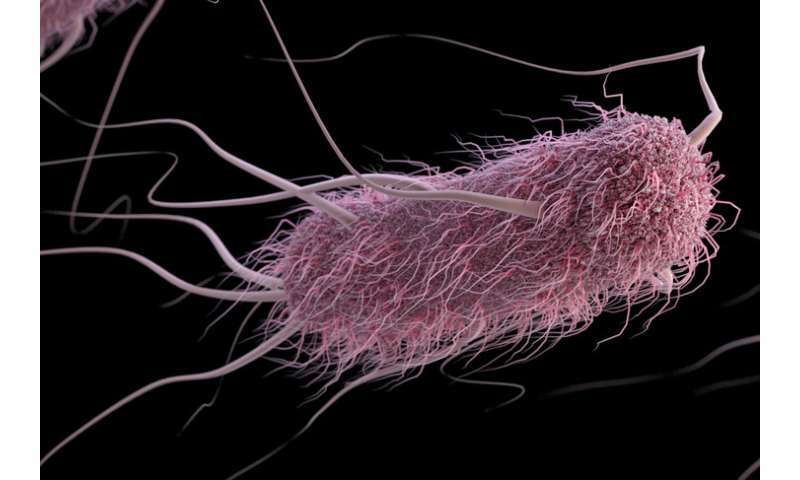 We demonstrated that having flexible elastic flagella can sometimes help bacteria to escape such entrapment, for example when nutrients are added to the solution and increase bacteria motility." Bacteria that build up on biomedical devices (e.g. catheters) and industrial and agricultural pipes and drains in the form of biofilms are difficult to remove and can be resistant to biocides and antibiotics. Understanding how bacteria can escape from walls could eventually inform ways to control or prevent the formation of these often damaging biofilms. Another application may be the ability to develop better ways to trap bacteria, for example to identify types of bacteria in a liquid or to filter them out. "Our results indicate that if you want to trap bacteria, simple traps may not be enough," said Igor Aronson, Huck Chair Professor of Biomedical Engineering, Chemistry, and Mathematics at Penn State and senior author on the paper. "We would need to produce something more sophisticated. Using elastic flagella is one way motile bacteria respond to their environment to persist in harsh conditions."